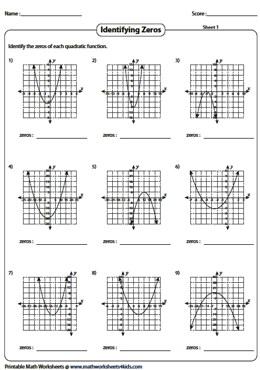 Use this ensemble of worksheets to assess student's cognition of Graphing Quadratic Functions. This webpage comprises a variety of topics like identifying zeros from the graph, writing quadratic function of the parabola, graphing quadratic function by completing the function table, identifying various properties of a parabola, and a plethora of MCQs. This forms an excellent resource for students of higher grades. 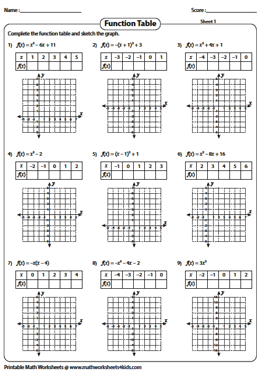 Printing Help - Please do not print Graphing Quadratic Function worksheets directly from the browser. Kindly download them and print. Each worksheet has nine problems identifying zeros from the graph. Read the parabola and locate the x-intercepts. x-intercepts of a parabola are the zeros of the quadratic function. 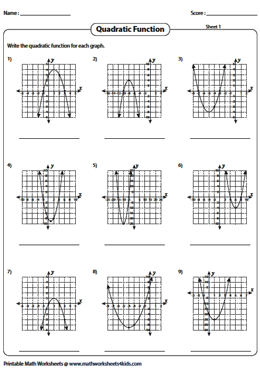 This set of worksheets requires students to write the quadratic function using the information provided in the graph. If the x-intercepts are known from the graph, apply intercept form to find the quadratic function. If the vertex and a point on the parabola are known, apply vertex form. Complete each function table by substituting the values of x in the given quadratic function to find f(x). Plot the points on the grid and graph the quadratic function. The graph results in a curve called a parabola; that may be either U-shaped or inverted. 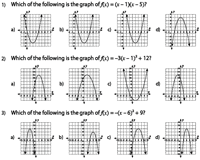 Identify the correct graph that represents the given quadratic function. 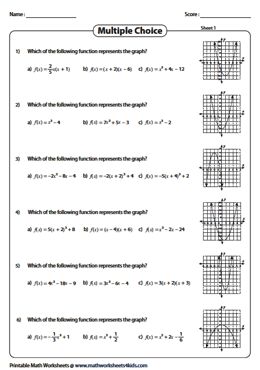 Level 1 worksheets contain quadratic function in vertex form or intercept form. Level 2 requires students to convert the standard form of a quadratic function to vertex form or intercept form using factorization or completing the square method. 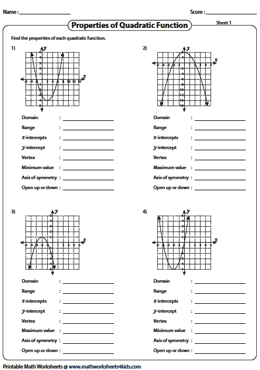 These worksheets are based on identifying the correct quadratic function for the given graph. Students should collect the necessary information like zeros, y-intercept, vertex etc. From the graph to identify the quadratic function. Read each graph and list down the properties of quadratic function. Algebra learners are required to find the domain, range, x-intercepts, y-intercept, vertex, minimum or maximum value, axis of symmetry and open up or down. There are four graphs in each worksheet.